Rhododendron yakushimanum 'Golden Torch' (Rhododendron yakushimanum 'Golden Torch'): growing, planting, caring. An exceptional cream and pink blooming. 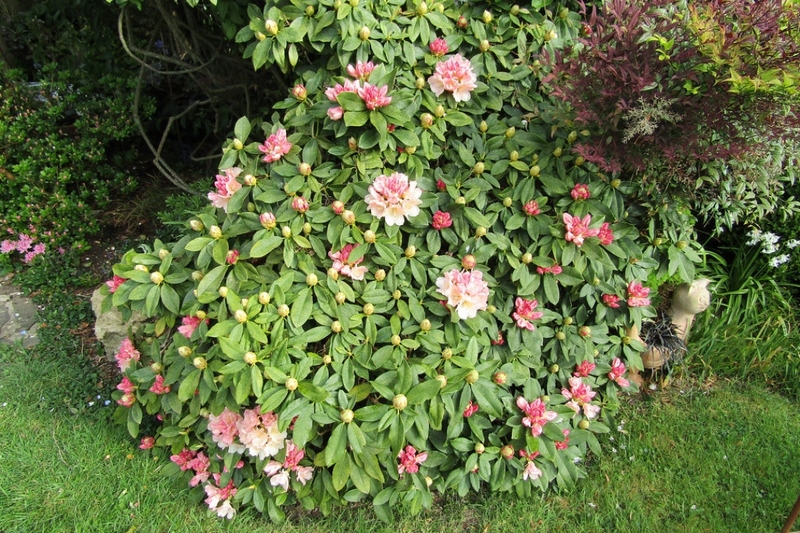 Full description for Rhododendron yakushimanum 'Golden Torch' not yet available. Rhododendron is a spreading or rounded shrub, sometimes up to 15 meters high, especially in the Himalayas. They are found naturally in mountainous regions, such as the Alps, the Pyrenees, and further afield in the Caucasus or the Carpathians! 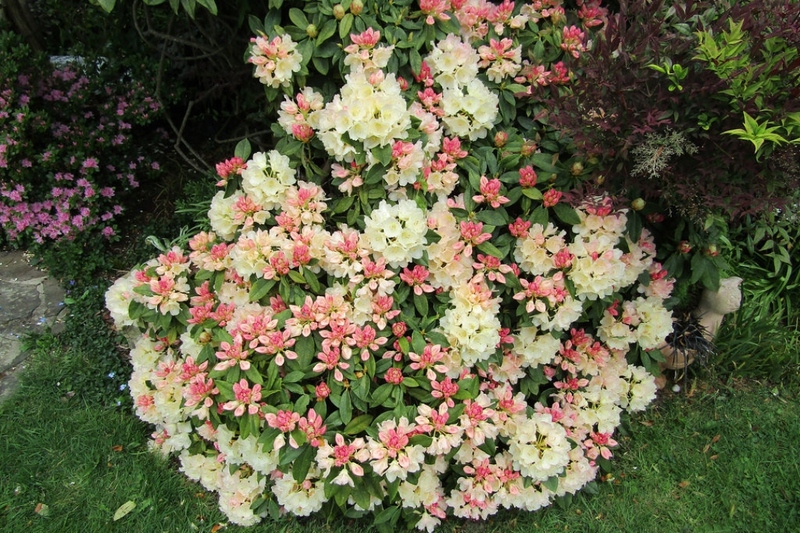 It is an extremely acidophilic plant, but some varieties accept to be grown in neutral or slightly calcareous soils - this is the case of Rhododendron hirsutum. Its foliage is dark green, the flowers are shaped in flared trumpet and can be pink, white, lilac pink, mottled purple, salmon pink, carmine. They usually bloom from April until the end of July, for the later forms. Rhododendrons are heathland soil plants - they like rather acid soils! We strongly advise you to avoid planting unsuitable plants for your area. Even in artificialising the environment by replacing the land, the development will always be less satisfactory than with a more suitable species. Plant it in April or early fall. The rhododendron enjoys a semi-shaded or shaded exposure: it will prefer a north-west orientation. They can be planted as a group, as a massif, as a hedge or as a border. They can also be grown in a pot, on a terrace or a balcony, especially. Unroot the plant from its container. Gently detach the roots from each other, making sure they do not cross each other. Put the root ball in a bucket of water to re-hydrate it. Make a large hole, about a half meter, then crumble the soil that you removed and mix it with heather earth - about 1/3 of earth for 2/3 of heather earth. You can also bring some sand and potting soil if you have it on hand! Discard some organic fertilizer for heather plants at the bottom of the hole. Arrange your plant in the middle of the hole taking care to spread the roots on the bottom. If your soil is too calcareous, you can put a geotextile felt at the bottom of the hole to create a kind of heathland soil. Fill the hole, slightly tamp the ground, and water abundantly! In pots, plant in a mixture of heather earth and loam, over a layer of gravel. 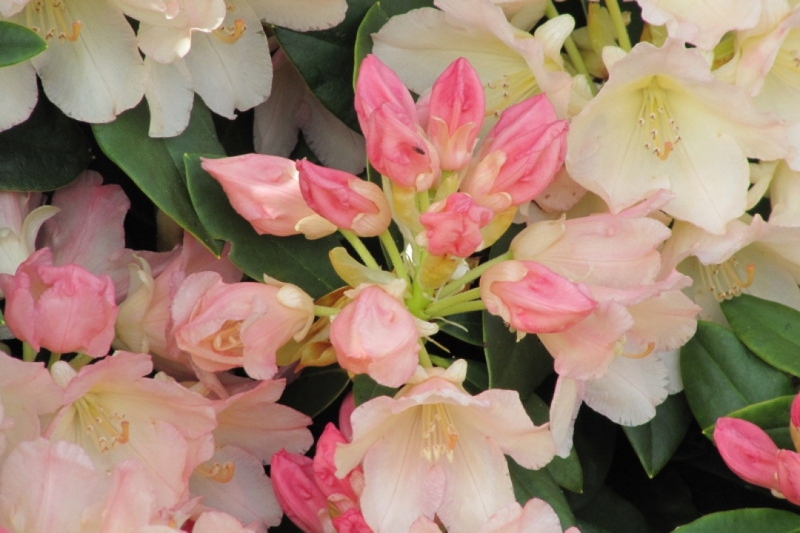 The rhododendron's main demand is water! The soil must stay cool, even during summer. Thus, it must be generously watered regularly with softened water. At the end of summer, you can space out the waterings. Be particularly attentive to potted azaleas: the surface dries faster, and the plant has very little reserves: a dry bout will be deadly! One thing: you should form a hollow at the base of the shrubs and then spread out a 10 cm thick layer of mulch. In the spring, water in the morning, and in the summer, in the evening after the sun has set. If you can, avoid hard water! An easy solution is to collect rain water... If in doubt, add fertilizer for heather from time to time to help solve the problem. For a beautiful bloom, you can make an input of manure well decomposed or compost, in the spring, spreaded at the base of the plants. In heavy alkaline clay soil, add some sulfur to the surface, being careful not to overdose it. Your rhododendron, if it is in pot, will appreciate new shoes, every 3 or 4 years! Repot at the end of winter. Take out the root ball by tapping the edge of it. Lay the mound on the side, then with a sharp knife cut the lower third of the root ball: the root system is thin and dense and it is easy to reduce its size. Then remove a crown of roots and soil on the perimeter. You will have reduced the rootball by about half. Place a layer of gravel at the bottom of the pot for drainage, and repot in a mixture of earth and heathsoil with a little sand. Finally, tamp and water copiously. A few days later, you can do a light thinning pruning. Prune young plants to favor a well-branched form: the first two or three years, in April or May, pinch the tips of new shoots over a leaf; you will eventually renew the operation in the summer. You will have a less abundant flowering these years, but you will guarantee years well flowered beyond! 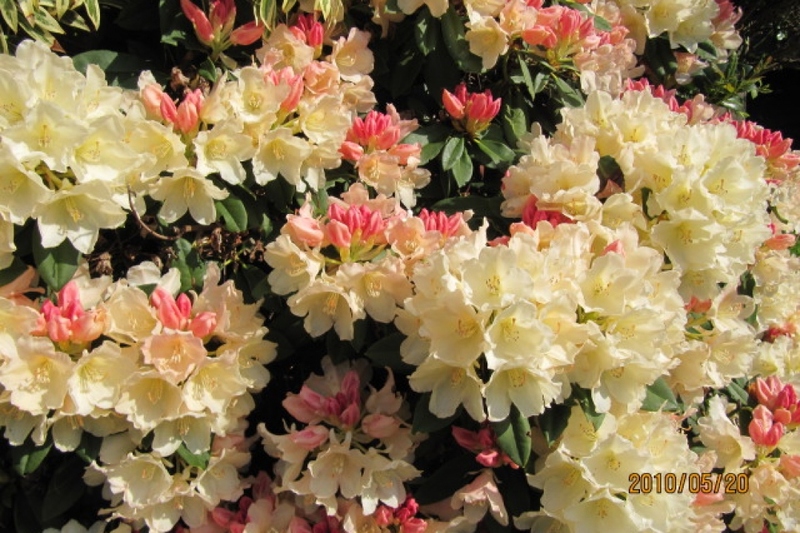 Rhododendrons are often prone to chlorosis, which is characterized by yellowing of leaf veins due to limestone. The remedy is simple: make contributions to increase the acidity of the soil! If the leaves turn brown, the soil is poorly drained, gravel or clay balls must be placed at the bottom of the planting hole. They can also be victims of mushroom attacks that benefit mainly from the weakness of the plant in calcareous soil or soil with low drainage.